Introduction: In the present study, we analyzed anti-proliferative and apoptosis induction activity of five phenolic compounds: echisoside, pleoside, chlorogenic acid, 4,5-Di-O-caffeoylquinic acid, and cynarin on AGS (adenocarcinoma gastric) cell line. Method: These phenolic compounds were isolated from methanol extract of Dorema glabrum root. An MTT assay was conducted to evaluate the inhibitory effect on cancer cells. EB/AO staining was done to assess the mode of cell death and morphological changes of the cells’ nuclei. Cell cycle distribution of the cells was analyzed by flow cytometry, and for further confirmation of the pathway, mRNA levels of apoptosis cascade players were quantified by qRT-PCR. Result: We found that echisoside, pleoside, chlorogenic acid, 4,5-Di-O-caffeoylquinic acid, and cynarin inhibited the proliferation of AGS cancer cells in vitro. Our data revealed that these compounds triggered morphological changes characteristic of apoptotic cell death. These compounds up-regulated bax and caspase3 expression and down-regulated cyclin D1, bcl2, VEGFA, c-myc and survivin. Moreover, cell population increased at the G1 phase, and a number of cells at the G2/M phase of the cell cycle decreased after treatment. Conclusion: All these data suggest that phenolic compounds have a cytotoxic effect on gastric cancer cells and could trigger apoptosis. 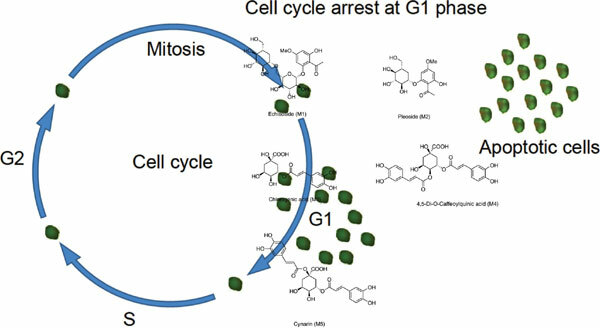 Besides cytotoxic activity, they could potentially arrest the cell cycle at the G1 phase. Caffeoylquinic acid, phloroacetophenone glycosides, gastric cancer, apoptosis, cell cycle.